Cortland, New York (Oct. 3, 2017) – Automotive Lift Institute (ALI), the trade association dedicated to vehicle lift safety, has completely updated its popular Lifting It Right online training course. 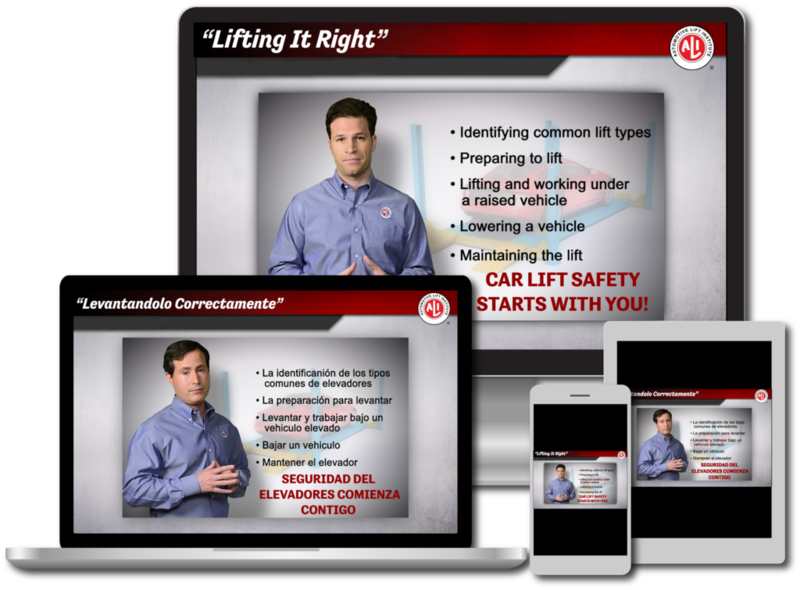 The interactive course covers safe lifting practices for all types of automotive lifts. For the first time, the course is now offered in English or Spanish. 2017 marks the 30th anniversary of the introduction of Lifting It Right as a simple safety manual in 1987. While the core focus on lift safety is unchanged, the new course is thoroughly modernized, both in content and delivery. The course can be taken online with a computer or mobile device. Most people finish it in an hour or less. At the end, a certificate of completion is stored online for easy access if a shop needs to produce training records. In addition to updated technical content, ALI has added professional narrators, real-world scenarios, and all-new 3-D animations to make the program more engaging. Lifting It Right is available to order from ALI at www.autolift.org/ali-store/. It is administered by enterprise risk management firm KPA. While the previous version of the course cost $29 per person, it is now available for just $16 for English and $24 for Spanish. Once registered, the trainee can take up to 90 days to successfully complete the program, including an online test.